Dave Mammoliti, Sonia Hawrylyshyn and Erica Balch received the inaugural TMG awards, along with Shelly Easton (not pictured). Photo by Sarah Janes. 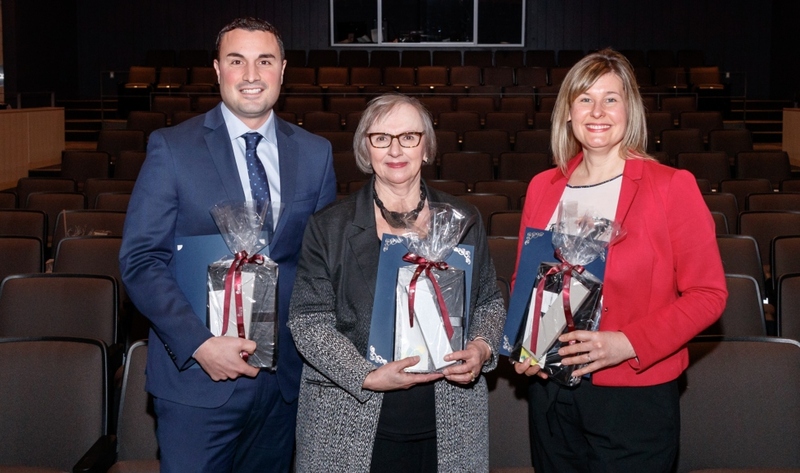 Four McMaster employees have received The Management Group (TMG) inaugural peer-to-peer recognition awards in celebration of their dedication to McMaster and their embodiment of the university’s core leadership capabilities. Erica Balch, Shelly Easton, Sonia Hawrylyshyn and Dave Mammoliti received the awards at the TMG forum on January 31. Balch, Public Relations Manager, Mills Library, Communications and Public Affairs, was recognized for her leadership in investing in relationships. Easton, Manager, Communications, Communications and Public Affairs, earned the award for taking a strategic approach to her work. “Shelly promotes a world-class image of the university through her contributions. She has gained the trust of senior fundraising leaders at McMaster, helping to find just the right words to inspire significant and ground-breaking donations. Her commitment to McMaster’s culture through participation in alumni and community events is truly commendable,” said Thyret-Kidd. Hawrylyshyn, Manager, Employee Career Services, Human Resources Services, received the award for her work in developing people. “Sonia demonstrates McMaster’s leadership capabilities by helping many employees find meaning in their work. She provides balanced and timely feedback by not only taking time to identify opportunities for improvement but also to debrief and celebrate success,” said Debbie Sabatino, TMG committee co-chair, presenting her with the award. Mammoliti, Acting Director, DeGroote School of Business, won the peer recognition award for his work in driving results. Nominations for the 2019 TMG Peer Awards will open in October 2019. Four McMaster employees have received The Management Group (TMG) inaugural peer-to-peer recognition awards in celebration of their dedication to McMaster and their embodiment of the <a href="https://employeecareers.mcmaster.ca/development/examples/our-leadership-capabilities/" target="_blank" rel="noopener">university’s core leadership capabilities</a>. Erica Balch, Shelly Easton, Sonia Hawrylyshyn and Dave Mammoliti received the awards at the TMG forum on January 31. Balch, Public Relations Manager, Mills Library, Communications and Public Affairs, was recognized for her leadership in investing in relationships. “Erica has an exceptional ability to build relationships with colleagues across departments, units and faculties,” said Andrea Thyret-Kidd, TMG committee co-chair, while presenting the award. “She has created a positive experience for students, employees and partners through her tireless work as the communications lead on several strategic initiatives. She also easily juggles competing and conflicting priorities with tact and good humour.” Easton, Manager, Communications, Communications and Public Affairs, earned the award for taking a strategic approach to her work. “Shelly promotes a world-class image of the university through her contributions. She has gained the trust of senior fundraising leaders at McMaster, helping to find just the right words to inspire significant and ground-breaking donations. Her commitment to McMaster’s culture through participation in alumni and community events is truly commendable,” said Thyret-Kidd. Hawrylyshyn, Manager, Employee Career Services, Human Resources Services, received the award for her work in developing people. “Sonia demonstrates McMaster’s leadership capabilities by helping many employees find meaning in their work. She provides balanced and timely feedback by not only taking time to identify opportunities for improvement but also to debrief and celebrate success,” said Debbie Sabatino, TMG committee co-chair, presenting her with the award. Mammoliti, Acting Director, DeGroote School of Business, won the peer recognition award for his work in driving results. “Dave tackles any project with McMaster’s strategic priorities in mind,” said Sabatino. “He seamlessly balances his personal and professional growth with both career expectations and family obligations. And he freely offers his time and expertise to ensure initiatives are successful, even when they are outside his defined role.” Nominations for the <a href="http://www.workingatmcmaster.ca/tmg-committee/index.php" target="_blank" rel="noopener">2019 TMG Peer Awards</a> will open in October 2019.